■Max. load: 9.0mm dia. wire. ■3D former + multipurpose scroll. 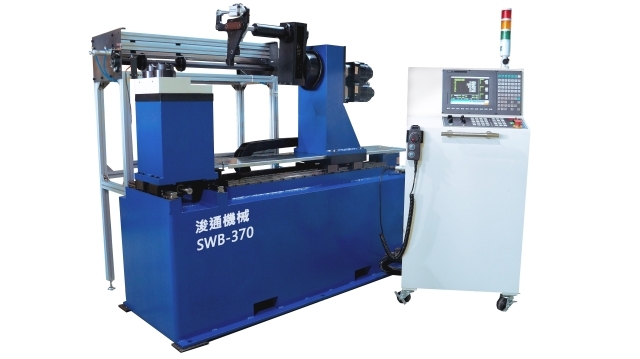 ■Standard, 9 shafts (4 slides, 1 wire feeder, 3 3D forming bases, 1 multipurpose scroll)■Max. 16-shaft PC capacity. ■Additional servo slide and scroll (optional). 4 tool sets, 1 1500kg loader, 3 auxiliary cylinders, 2 probes, 1 manual control roller. Optional attachments: Rotating wire shaft (max. load 5.0mm/80C dia. wire), additional servo slide, additional servo scroll, tool & spring setter. No. of shaft: 9 standard; 16 shafts max.